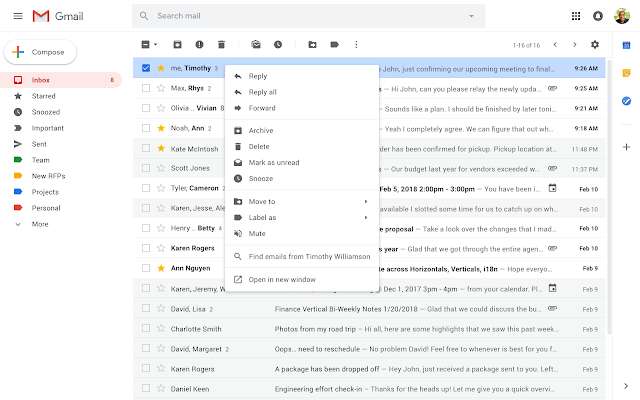 Gmail users are about to get a much-needed productivity boost thanks to a revamp of the web app’s right click menu. The new menu will allow users to access several common features right from the inbox. For example, users can right-click on an email to reply to or forward it from their inbox. Additionally, users can search for all emails from a sender or, if they have conversation view turned off, search for all emails with the same subject. The new right-click menu allows users to open multiple emails in new windows at the same time, quickly add a label to an email or move an email. Of course, users will still have access to basic functions like archiving, deleting and snoozing emails. Google says the feature is rolling out starting February 11th and will take place over the next two weeks for ‘Rapid Release’ G Suite users. ‘Scheduled Release’ users will see the feature roll out starting February 22nd and it could take one to three days. Free users tend to see these new features around that time as well, so you can expect to see the new right-click menu soon.